The launch was never supposed to be the hard part for this Falcon 9—this launch is supposed to be all about the landing, which SpaceX conceded going into the first launch that they expected it to end in a crash. Instead, the first two attempts were scrubbed over issues with the rocket’s new liquid oxygen fuel system and then the third was called off after a boat wandered too close to the launch system. This fourth attempt will take place tonight at 6:35 p.m. (ET). 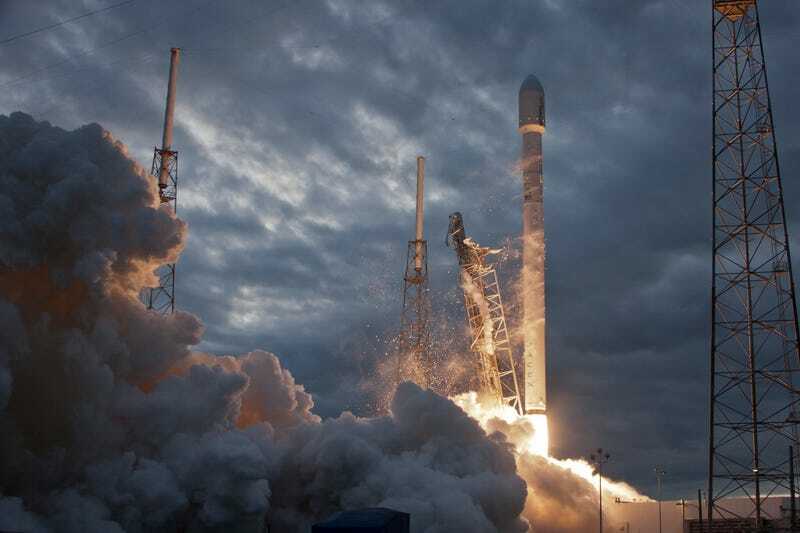 If all goes well, the Falcon 9 will release a SES-9 communications satellite high into the air, before attempting to land itself on a drone-piloted ocean barge. If it manages to stick the landing, it will be the first time a rocket has made an ocean landing. As they’re testing a new experimental orbiting plan, though, SpaceX says there is every reason to expect it to crash (“a successful landing is not expected,” they note, a trifle mournfully). Still, at this point even a crash landing would be quite something to see as not only would it tell the engineers something valuable for the next flight, it would also mean we finally got the launch. Check back at 6:35 (ET) to watch—the livefeed will kick off 20 minutes before. They’re going to reschedule for a less windy day. We’ll see you again for attempt 5.